Hailing from Melbourne’s west, Fluent Form returns with his sophomore album The Furnace, due out October 20th on Crate Cartel through Obese Distribution. Chapters of Substance (Fluent’s debut release) sold out and is now only available from a select few stores, if you’ve not had the pleasure of copping this, due yourself a favour and have a listen to Part 1 in Fluent Form’s release cycle. 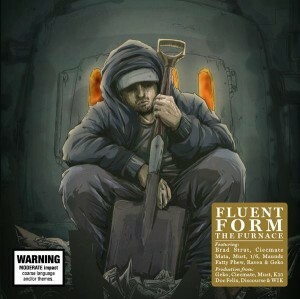 As the preview tracks off the album show Fluent Form is progressing his sound and style further slowly, without alienating old fans. The album production is handled by Crate Cartel’s Geko, with guest verses being supplied by old hats Brad Strut and Ciecmate with some of Melbourne’s best in Mata N Must, 1/6, Maundz, Fatty Phew and crew members Raven and Geko. With a diverse range of production from Geko, Ciecmate, Doc Felix, Must, K21, Methodz, Discourse and WIK joining the fray. Head to your local JB Hifi and pick up a copy of Fluent Form – The Furnance as it’s currently not available on iTunes (Update: The Furnace is now available via iTunes, so grab it now). Alternatively you can grab the album direct from Crate Cartel. After the success of his independently released debut album Chapters Of Substance, Fluent Form wasted no time in returning to the studio to begin work on his sophomore LP, The Furnace. Across these 14 tracks, Fluent continues to demonstrate his ability as a lyricist to combine concepts with complexity. To add to this release, Fluent has recruited a stellar line-up of guests including veterans Brad Strut and Ciecmate alongside some of Melbourne’s premier talents; Mata N Must, 1/6, Maundz, Fatty Phew and crew members Raven and Geko. With a diverse range of production from Geko, Ciecmate, Doc Felix, Must, K21, Discourse and WIK, this is an album for the heads that like their Hip Hop genuine and honest.